My first flight on Hong Kong Airlines was a great one. Hong Kong Airlines offered excellent service and comfort onboard its A350-900 in business class. Hong Kong Airlines does offer online check-in on some flights, but I was unable to issue boarding passes online for my flight from Los Angeles. Thus, I was forced to visit a counter for a paper boarding pass. Hong Kong Airlines operates out of the Tom Bradly International Terminal at LAX. While the economy class lines were quite long, there was no wait in the business class check-in long. Soon, I was on my way to the Los Angeles International Lounge for about 45 minutes prior to boarding. Boarding began 15 minutes late due to a late-arriving aircraft from Hong Kong. Still, we ended up taking off on time. I was welcomed onboard by a flight attendant and directed to my seat in row 12, the first row of business class. Hong Kong Airlines has two types of business class seats aboard its fleet of five A350-900s. One aircraft currently has reverse herringbone seats while four others, including mine, offer a staggered business class seat. Both types of seats offer direct aisle access to each customer and both cabins include 33 seats. The “older” seats on my flight are outfitted in red fabric with Chiense characters. Note, the staggered 1-2-1 configuration offer more private seats in even-numbered rows and “honeymoon” seats in odd-numbered rows. Lights, plugs, and a passenger service unit were available. Storage is limited though the cabinet offered a place for my passport, wallet, and mobile phone. Note that the seats require a shoulder strap as well as a lap-belt for take-off and landing. I found the seats to be very comfortable and ended up sleeping for over 12 hours…a glorious rest considering the flight left at 10:45AM (though I had stayed up the night before). Bedding is average…the blanket is the same blanket I recently experienced in Norwegian Air Premium Class; a bit too short for my liking. One reason I slept so well is because the cabin was cold…ice cold. I usually take my socks off when I sleep, but not on this flight; it was too chilly and the blanket too small. There was no individuals air nozzles, but it did not matter (HX’s fifth A350-900 has air nozzles). The entire flight was bathed in daylight, but the window shades keep the cabin the dark. Let’s start with wi-fi. 15 hours is a long time to go without wi-fi, but my goodness…prices are horrible. I connected only briefly due to the $22.99/100MB pricing. Even with automatic updates turned off, by the time my imessage and Outlook inbox updated, the 100MB was gone. I watched The Terminal (always great) before going to sleep, noting the flight had a nice selection of movies, TV shows, games, as well as two live TV channels.. I don’t get any audio (to speak of) when flying United and always appreciate a nice collection of classical musical. Here, I also enjoyed a Disney Jazz CD. FYI, cheap noise-cancelling headphones were provided and I recommend you bring your own. But my favorite IFE was the tailcam, which offered superb HD video as we flew from Los Angeles to Hong Kong. I loved the menus themselves. The artwork on it was unique and visually appealing. Prior to takeoff, FAs offered a choice of water or orange juice. A bottle of Evian water was also present in the seat console. Immediately after takeoff, table cloths were laid for lunch. 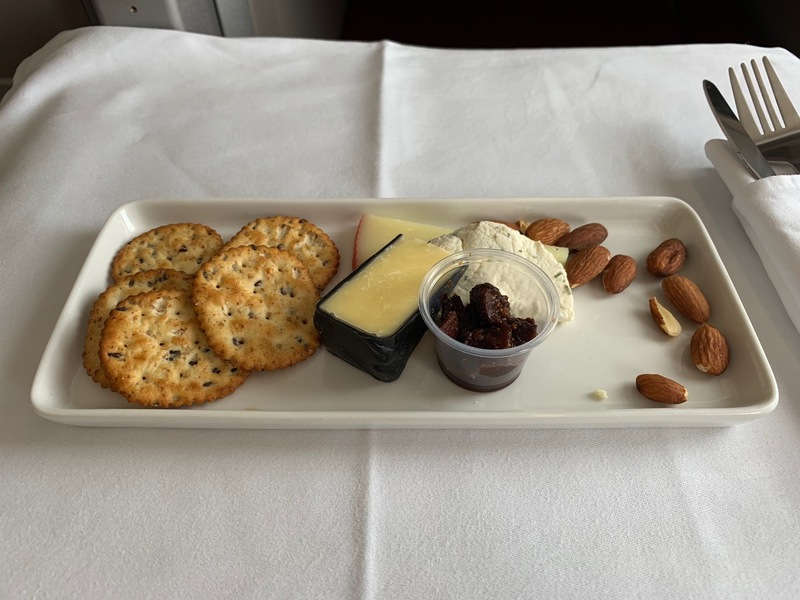 A small ramekin of mixed nuts was provided with choice of beverage and a hot towel. Overall, lunch was superb. The appetizers (smoked salmon, capicola, fennel salad) were just okay and the soup was lukewarm and tasteless, but the lamb cutlets were tremendous and so was the polenta. Succulent and flavorful, I was left very content. Garlic bread was also offered that was strong in favor and piping hot. But the meal got even better, with an excellent cheese course followed by an apple rhubarb tart. The tart was accompanied by espresso, which was strong (just the way I like it). Cappuccinos are not available onboard. I truly enjoyed this meal and a full stomach helped me to quickly fall asleep. FA sets up a display of snacks in the galley immediately after the meal. These included donuts, packaged pretzels and nuts, and whole fruit. 90 minutes prior to landing, dinner was served. The meal began with a fruit course. I ordered Chasseur chicken with risotto and vegetables, served with more garlic bread. The chicken was fatty, but the risotto good. Dessert was a raspberry chocolate mousse cake. I enjoyed once more espresso before landing. The crew was young on this flight, but very professional and attentive. I was addressed as “Mr. Klint” by the two FAs working my side of the aisle and appreciated that they frequently monitored the cabin during the meal services. The crew did indeed look like the in-flight magazine ad below, but where not at all silly or laidback. Slippers and an amenity kit were provided. My feet aren’t huge, but the “large” slippers were still far too small. The amenity kit included L’Occitane amenities, toothbrush, toothpaste, socks, eye shade, and ear plugs. I brought my own pajamas and changed into them after takeoff. Lavatories were clean, though I was surprised that the mirror was shattered in the lavatory on my side of the cabin. At a later point in the flight, some L’Occitane hand cremes were added to the lavatory. Hong Kong Airlines met or exceeded all my expectations. I enjoyed my flight and would not hesitate to recommend this airline to others. Would I return at normal prices? Probably not, but only because I’d rather use miles before dropping $4K on any ticket. FYI – I believe air nozzles are an option that the airline can add in or out, not based on production date. Nice review! Are the bulkhead footwells more spacious than regular seats? It’s a shame that Wi-Fi is so expensive! 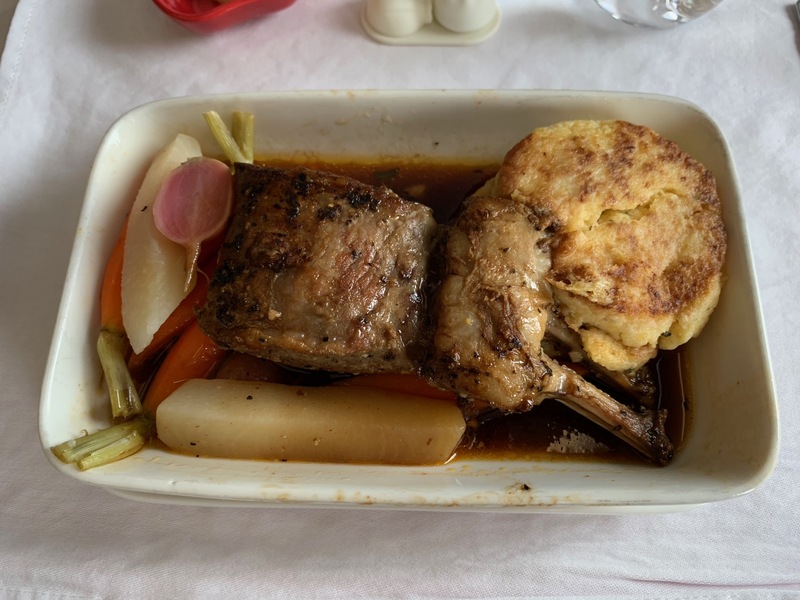 😮 I don’t get why most airlines don’t provide free (or affordable) Wi-Fi for premium cabin pax… 🙁 Also, that lamb looked way overcooked to me, but glad that it was good! I’m always wondering while reading your reviews, and especially the parts about bedding whether there excist special sets (eg duvet, pillow and sheet) that work well in business class seats. Usually I find bedding to be mwah, and it could kill my night’s rest… Any tips there? Great report and especially love all the detailed photos. Keep it up! That amenity kit bag is gorgeous and so much more interesting than most. I usually donate the contents to a women’s shelter if I don’t use them, but keep the bag if it is pretty or useful and this one would definitely be a keeper. Additionally, it looked like the small round mirror in the lav was a makeup mirror (next to the cracked mirror part), was it? That would be amazing for anyone who wants to touch up makeup. Thanks for including details on cabin temp and the availability of air nozzles in this and your recent American biz review. Definitely details I look out for! “Note, the staggered 1-2-1 configuration offer more private seats in odd-numbered rows and “honeymoon” seats in even-numbered rows.” It’s actually the opposite — even seats have more privacy.